Chronic means that in terms of alcohol addiction there is no absolute recovery once and forever. For example, a person stops drinking alcohol after treatment and lives a sober life for many years, making no difference from other people who have never had a problem with alcohol. But if one day he would like to try alcohol again,very soon he inevitably will find himself in a situation where he was before treatment. Progressive means that over time the mental and physical condition of an alcoholic progressively deteriorates to the limit where pathological changes become irreversible. Physical means that excessive consumption of alcohol over a long period of time results in metabolic disorders andin emergence of so-called alcohol related diseases. The most common of which are fatty liver, cirrhosis, neurological and cardiovascular disorders. Mental means negative changes in personality, loss of former normal interests, broken family and interpersonal relationships, inability to perform the specific tasks and reach the assigned goals. Within time alcohol becomes for alcoholic the most important part of his life. In favor of addiction alcoholics are ready to sacrifice their own health and lives, as well ascareer and well-being of people around. Impaired volitional mechanisms, inability for self-control lead alcoholics to mental instability and progressive psychiatric disorders which often end up inpronounced personality disintegration and mental disability. Social means that alcoholics make people around them suffer as well. Endless scandals, scuffles, domestic violence, unsuccessful attempts to control alcoholic’s behavior and disappointment create a specific type of relationship between an alcoholic and his family members which the psychologists call “alcohol co-dependence”. Alcoholism is a curable disease, but it requires special treatment. Advanced diagnostic technologies such as multi-channel EEG, magnetic resonance imaging clearly demonstrate the pathological changes in brain of alcohol addicted people. 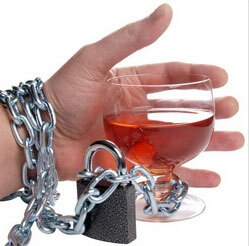 Alcohol similar to drugs badly impairs the biochemical processes in nervous system, destroys the highly sophisticated and delicate balanced systems of self-regulation.Alcohol causesthe pronounced deficit of natural endorphins in the brain, which is proven to be akey moment in development and maintenance of any kind of addiction. 1. State of constant psychological and physiological need for alcohol intoxication. 2. Loss of control over the amount of consumed alcohol. 3. Growing tolerance to alcohol. 4. Inability to stop using alcohol, even knowing that it involves the most negative consequences. 5. Emergence of the withdrawal syndrome.Condition characterized by both physical and mental discomfort a person experiences out of alcohol intoxication and which can be alleviated by use of another dose of alcohol.